For those of you who want to enjoy the beauty of a lake, can come to Kalimutu there color lakes. where the lake is located in East Nusa Tenggara. 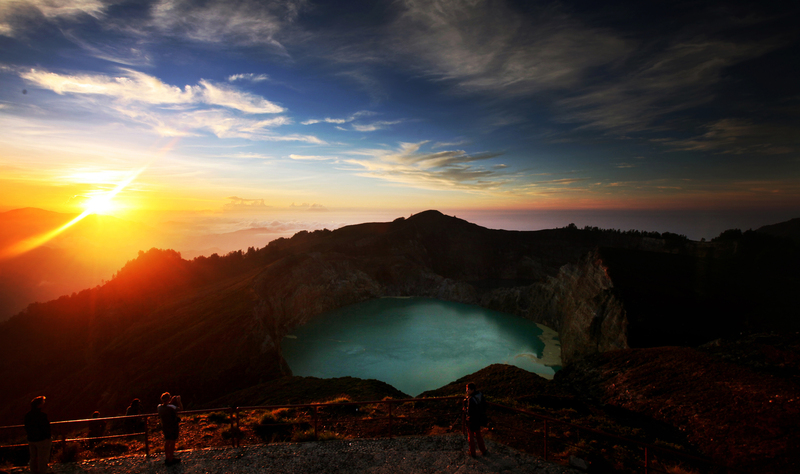 Kelimutu Lake is one of the lakes that can be visited during holidays, which will give a stunning view of the lake. Kelimutu Lake is included in the Kelimutu National Park, which has a height of around 1700 meters and contains 4.5 hectares of forest. In the forest there are lots of native Indonesian flora and fauna. Visiting the Kelimutu lake, will make you fascinated by the beauty of nature and views of the lake. Tourist attraction that you can visit first is tourism forest. Where in this forest you will enjoy the calm of the atmosphere and also the spectacular views of the forest. Visiting Kelimutu will indeed be immediately welcomed by this tourist forest, where this is the beginning of your journey to get to the main tourist attraction. Although this forest is the same as other forests, but to reach the lake can only pass through this forest. Where you will also be able to enjoy the breeze and if you are lucky you can find animals or plants that are difficult to find. Not long after entering the forest, you will see a steep cliff formed by natural hands. It is advisable not to look too closely, because it is very dangerous. In addition, when you walk through the forest, you might be able to meet the monkey who is a forest dweller. After entering the forest and seeing steep cliffs, then you will climb 15 steps. Where exactly you will be presented with two lakes from three lakes in Kelimutu, namely Lake Tiwu Nuwa Muri Koo Fai and Tiwu Ata Polo. This is where you will enjoy the beauty of Kelimutu there color lakes. The two lakes are only located and are only separated by towering corals, where the Tiwu Ata Polo lake has a deep black water color or red color, While Tiwu Nuwa Muri Koo Fai has a green Tosca color. The last lake is tiwu ata mbupu which is located on the hilltop of the national park Kelimutu. To reach the lake itself, you must prepare energy because you have to climb hundreds of stairs to be able to enjoy the third lake. Tiwu Ata Mbupu has a white color. Those are some of the sights that you will enjoy if you visit Kelimutu. Where there are facts that need to be known, that the color of the water in the lakes often gives different colors depending on several reasons. To be able to see the beauty of these three lakes, do not hesitate to go Kelimutu there color lakes.